Good Morning crafty friends, its Tuesday and time for another challenge over on Crafty Sentiments Designs. This week's challenge theme is all about the Men/Boys. 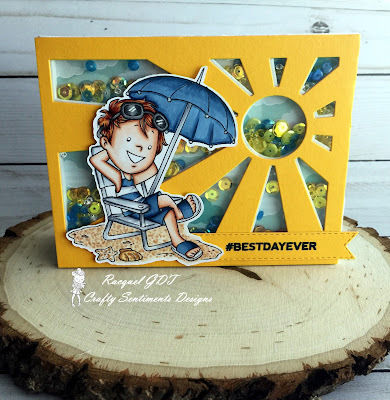 Today's card features the stamp set Sunshine, yes he is ready for some sunshine and the beach. I created a shaker card using a new sunburst die I picked up from Queen and Co. I added some pretty pink posh sequins to the shaker card and used the cloud designer paper from American crafts sunshine. I stamped the image out on copic x-press it blend card stock and colored him up using my copics. I cut the image out using my brother scan and cut and added him to the shaker panel. I then die cut the sentiment #bestdayever. Yep when you are hanging out on the beach, it is the best day ever. Definitely check out the other members of the team and what they created for this challenge. You can also join in over on our Facebook page as well. We look forward to seeing what you create using this week's theme. Thanks for stopping by and hope you have a Happy Crafty Day! What an unreal Shaker. Fantastic design, gorgeous colours and your image is just super and wonderfully coloured too. Great work. Thank you for sharing with us here today at World Wide Open Design Team Challenge and best of luck with your entry.